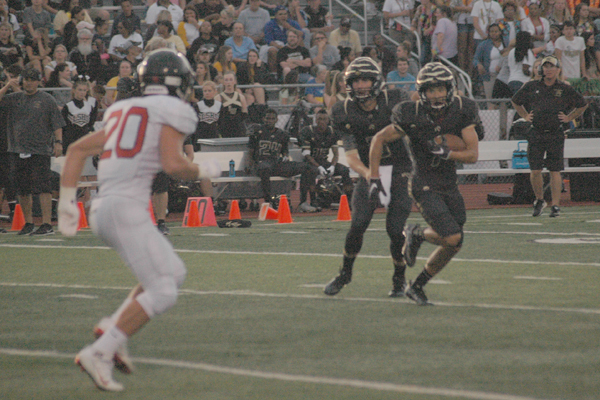 There were shades of Cal Stanford at Hertzog Stadium Friday August 26 as the Park Hill Trojans traveled to Lee’s Summit High School. The Tigers downed PHHS 20-13. Lee’s Summit students lined the fence in front of the student section eagerly awaiting the clock to hit zero. As a Trojan wide receiver caught a pass across midfield the students couldn’t be held back and ran onto the field while the play was ending. After a brief discussion the referees cleared the field and ruled there would be one untimed down. The Tigers came up with yet another sack ending the game for the second time and the celebrations commenced. “Apparently the clock did not run out before the students ran on the field,” Lee’s Summit head coach Eric Thomas said. “Whatever. We finished it,” he added smiling. The Trojans’ opportunistic secondary picked up right where they left off last week. Senior linebacker Zach Suppes picked off Dalton Hill’s pass on the game’s opening drive. The interception set Park Hill up on Lee’s Summit’s 27 yard line. After the interception the Trojans need only a handful of plays to capitalize. Junior quarterback Billy Maples hit senior Christian Lewis for the seven yard touchdown putting Park Hill up 7-0. The Tigers would answer on their next drive. Hill took a quarterback draw up untouched up the middle for 30 yards. On the ensuing third down Hill avoids a rush and lofts the ball 32 yards down field. Junior wideout Salvatore Garozzo did a good job coming back for the under thrown ball and hauling it in. Two plays later Garozzo punched in a three yard run. A missed extra point left the Tigers down 7-6. Both teams would struggle to put together long drives. Park Hill had a long drive stalled inside the red zone and settled for a field goal. The Trojans took a 10-6 lead into the locker room. In the third quarter LSHS put together their longest drive of the day. The tigers marched down the field with strong runs by Garozzo and passes from Hill to Samaj Brewer. Brewer shrugged off a hit at the 2 yard line after a 8 yard pass and walked into the end zone for the go ahead touchdown making the score 13-7. Park Hill’s offense was never able to get into rhythm. In the fourth quarter after a sack from Dante Davis Park Hill was forced to punt. The snap got by Parker Sampson and Lee’s Summit took over on Park Hill’s 2 yard line. On the net play Garozzo notched his second touchdown of the game and the Tigers were up 20-7. With only a couple of minutes left in the game Park Hill finally started to move the ball. Intermediate passes combined with screens to the wideouts led to a Trojan field goal cutting the Tigers’ lead to seven. The game looked to be on ice after LSHS recovered the ensuing onside kick. However, Park Hill forced a punt and had one more chance. The comeback came up short when the Tigers sacked Maples on the untimed down. Thomas couldn’t have been happier with how his team played. Next week Park Hill welcomes rival Park Hill South and Lee’s Summit hosts Fort Osage Friday September 2.